Sony HT-ZF9 Dolby Atmos soundbar review | What Hi-Fi? It’s onwards and upwards for Sony’s latest Atmos soundbar. 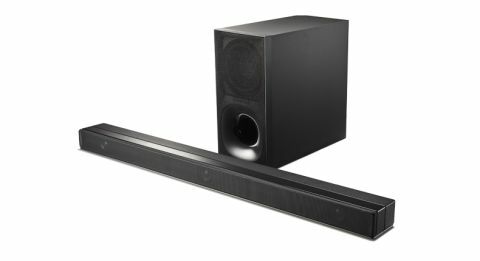 What does a Dolby Atmos soundbar look like? Long and thin? Check. Multiple inputs? Check. Upward-firing drivers? Hang on a minute. The Sony HT-ZF9 soundbar is the first we’ve come across that puts a question-mark in the final box rather than a tick. Though this soundbar only has three front-facing drivers, Sony claims it can still produce a 7.1.2 surround sound by ‘virtually’ processing audio so it appears to be coming from around you. Along with the soundbar, there's also a subwoofer with a 16cm driver to add low-frequency weight. The HT-ZF9 measures about a metre long, with a removable grill to hide its drivers. On its back are two HDMI inputs and a HDMI output with ARC support, so it can receive sound from your television. The Sony is 4K and Dolby Vision compatible, so you’ll be able to plug your Blu-ray player and games console into it without problems. There’s also USB, 3.5mm and digital optical inputs as well as an ethernet connection. Spotify and Google Chromecast are also on the menu. There’s Bluetooth too, which has been boosted with Sony’s LDAC technology for what the company claims is higher-quality playback from compatible sources. Setting up the soundbar is simple enough. Some Dolby Atmos soundbars come with microphones or lengthy calibration processes, but the HT-ZF9 does without. There are menus in its ‘advanced' settings to allow you to set the distance between soundbar, subwoofer and your sofa (which we would recommend doing) - but otherwise there’s not much to fiddle with. The soundbar’s interface, controlled by remote or the physical buttons on top of the bar, is clearly laid out. Hitting the 'home' button takes you to a three-part menu screen, divided into 'Watch', 'Listen' and 'Set-up'. The first switches between TV and HDMI inputs, while the second lets you select between Bluetooth, USB, 3.5mm analogue, Spotify or Chromecast audio. You’re unlikely to use these menus often, as the remote control has most of these options – however, we find the remote’s input switches a little imprecise. In the 'Set-up' menu, you can swap between Sony’s own vertical sound modes and Dolby’s ‘speaker virtualiser’. Both perform well, although we prefer Sony’s own settings – it has better tonal balance than Dolby’s in this instance, and gives you access to Sony’s EQ settings (which are disabled by Dolby’s virtualiser). These modes are worth trying out, but personal preference will dictate how much you use them. Switching to 'Music' bolsters the midrange on Daft Punk's Get Lucky, but also makes the song sound more condensed and focused. It’s worth noting the ‘Vertical S’ button, displayed prominently on the remote, doesn’t actually toggle Atmos or DTS:X. Rather, it’s an upmixer for non-Atmos tracks which helps give them greater dimensionality. It is automatically overridden when the soundbar detects Dolby Atmos content. The HT-ZF9 sounds pretty good. We play the Dolby Atmos soundtrack to Justice League and the soundbar does a solid job at placing different elements of the soundtrack. As the parademons fly around the home of a vulnerable family, you can clearly pick out where the hum of each of their alien wings is coming from. It doesn’t quite manage to place the sound directly overhead as well as some soundbars, such as Sony's own HT-ST5000 - but, of course, that bar is equipped with dedicated upfiring drivers and is around £1000 more expensive. Although there is a good sense of height and width here when compared to other similarly priced soundbars, zooming heroes flying overhead seem to be coming from the top of the television rather than directly above you. Tonal balance is surprisingly well handled. Dialogue comes through clearly in the midrange, without getting the way of treble frequencies or being overloaded by bass (when a superhuman punch from the Man of Steel shoots Aquaman into a nearby building, for example). Swapping to Avatar (with the mix upscaled using Sony’s own processing modes) reveals an impressive amount of weight to the Thanator (the alien, panther-like beast) as he chases the marine through the forest. Each pounce is punchy, and the rumbling sound as the creature smashes through trees is conveyed well. However, during bigger battles (whether playing Dolby Atmos or a more conventional stereo mix) the sound becomes a little muddled. It can become more difficult to make out exactly where sounds are coming from, as the soundtrack clashes with rocks tumbling and monsters roaring. We’d also like more subtlety when it comes to dynamics. Before the action sequence begins, the small horns and whispering leaves that set the mood struggle to truly convey any tension – leaving the scene relatively flat and lifeless. While the sheer difference in volume is adequate (this soundbar moves from quiet to loud smoothly), the tiny changes in sonic intensity that make your hair on the back of your neck stand on end could do with some refinement. A sub-£700 soundbar with impressive Virtual Sound technologies, a subwoofer, intuitive control system and decent sound quality is not to be sniffed at. While those looking for ‘true’ Dolby Atmos might want to consider spending more on Sony’s HT-ST5000 bar, for those on a tighter budget, the HT-ZF9 gets the job done.